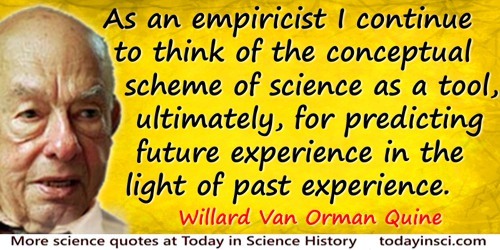 American logician and philosopher who is regarded one of the most significant philosophers in the later half of the 20th century. It is the tension between the scientist’s laws and his own attempted breaches of them that powers the engines of science and makes it forge ahead. My position is a naturalistic one; I see philosophy not as an a priori propaedeutic or groundwork for science, but as continuous with science. I see philosophy and science as in the same boat—a boat which, to revert to Neurath’s figure as I so often do, we can rebuild only at sea while staying afloat in it. There is no external vantage point, no first philosophy. Ontological Relativity and Other Essays, pp. 126-127, Columbia University Press (1969). Theories and Things (1981), 93. Science is neither discontinuous nor monolithic. It is variously jointed, and loose in the joints in varying degrees. 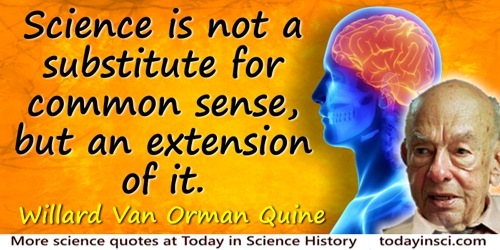 Science is not a substitute for common sense, but an extension of it. 'The Scope and Language of Science' (1954), reprinted in The British Journal for the Philosophy of Science (1957), 8, 2. Students of the heavens are separable into astronomers and astrologers as readily as the minor domestic ruminants into sheep and goats, but the separation of philosophers into sages and cranks seems to be more sensitive to frames of reference. Theories and Things (1981), 192. 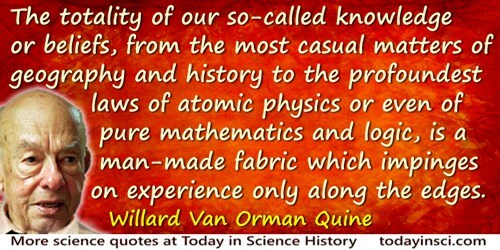 The totality of our so-called knowledge or beliefs, from the most casual matters of geography and history to the profoundest laws of atomic physics or even of pure mathematics and logic, is a man-made fabric which impinges on experience only along the edges. Or, to change the figure, total science is like a field of force whose boundary conditions are experience. A conflict with experience at the periphery occasions readjustments in the interior of the field. Truth values have to be redistributed over some of our statements. Reevaluation of some statements entails reevaluation of others, because of their logical interconnections—the logical laws being in turn simply certain further statements of the system, certain further elements of the field. 'Two Dogmas of Experience,' in Philosophical Review (1951). Reprinted in From a Logical Point of View (1953), 42. The word “definition” has come to have a dangerously reassuring sound, owing no doubt to its frequent occurrence in logical and mathematical writings. In 'Two Dogmas of Empiricism', From a Logical Point of View: Nine Logico-Philosophical Essays (1953, 1961), 26.